Here is another science surprise for kids. After Alex and Max popped balloons with a skewer, they did not have any other predictions for me, but “It will pop” when I started piercing my balloon. 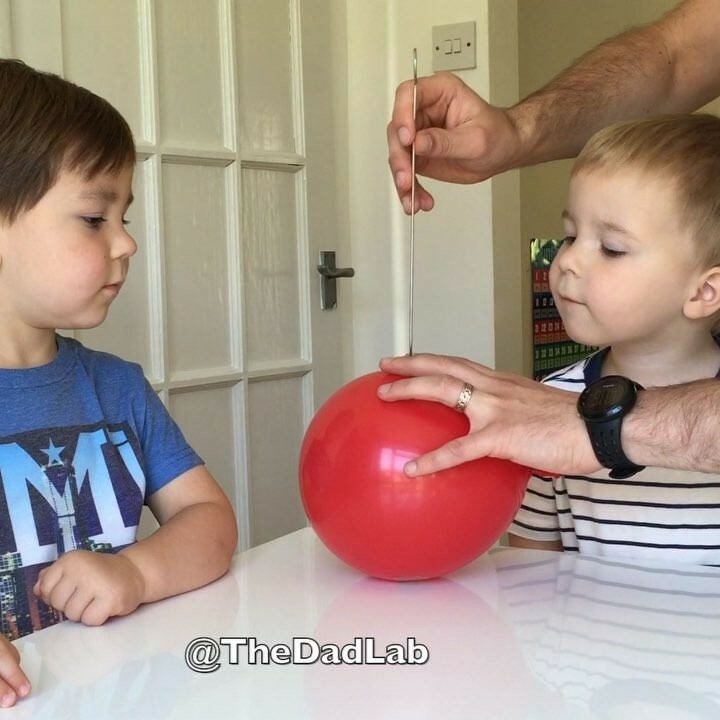 When in fact, there a two ways to pierce a balloon without popping it. The first way is to pierce the balloon through the top and bottom where the rubber is thickest. It is where the balloon material is under the least strain. Optionally you can dip the skewer in soap or oil. I didn’t . But to pierce balloon through sides, you need to add sticky tape pieces to the points where you want the skewer to go through. If you use clear sticky tape it will look more impressive, but please make sure that sticky tape really sticks to the balloon, otherwise the balloon will pop. This experiment demonstrates properties of the latex used in balloons. It’s elastic, but has very little shear strength. When a small tear is introduced to a portion of the rubber which has a lot of tension, the material cannot handle the stress. The rubber rapidly experiences a shear failure, resulting in a balloon popping. The dark spots on the balloon are thicker than the rest of the balloon. This is the point where the latex molecules are under the least amount of strain. The additional thickness of latex rubber allows the skewer to pierce the balloon without bursting it. When we add sticky tape to the balloon, it improves shear strength. Even thought you pierce the balloon, sticky tape holds it together.